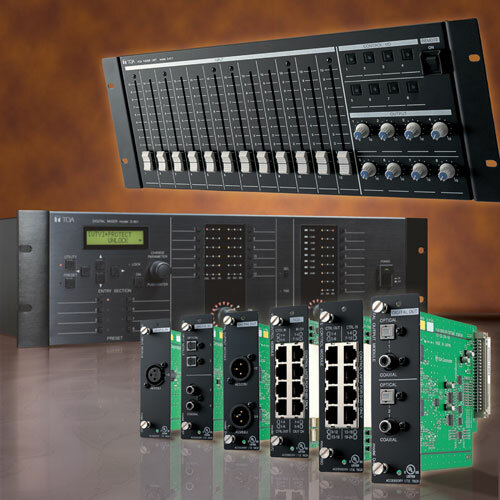 Assigning Inputs to Outputs - Assigning an audio source input to an output is one of the simplest programming features on the D-901 front panel. To do this, simply hold down the desired Input Channel Selector button, then press the desired Output Channel Selector Buttons that correspond to where you want to send the source signal. As you do this you will see your outputs indicated on the front panel LCD screen. Assign a Source to the Mic Bus - Sources that are assigned to the Mic Bus are routed through a 12-band feedback suppressor with fixed or dynamic frequencies. To assign a source to the Mic Bus, simply hold down the desired Input Channel Selector button and then press the Microphone Bus Selector Key [SEL]. As you do this you will see "M" the front panel LCD screen indicating if the input channel is assigned to the Mic Bus. BONUS TIP: The default mic bus setting for all channel inputs is ON. For a new install, be sure to disengage the mic bus for each input to start from scratch. Change The Mic Bus Output Settings - Out of the box, the D-901 Mic Bus defaults to be routed to all 8 outputs. To change the Mic Bus output assignments, simply press and hold the Mic Bus [SEL] button and rotate the Setting knob to select the output channel bus (1 - 8), then press the function ON/OFF key to enable or disable the assignment. When disabled (OFF), the "-" indication is displayed. Save New Presets - When you write a new preset, always remember to save your work! To do this, simply press the left and right arrow keys to select the desired preset memory number to which you want to save your settings. Then, press the Setting knob to execute the function. You're done! Stereo-Link Input Sources - Do you have a balanced stereo input signal? You can easily link two input channels so Input trim, EQ and other settings are shared between the channels. To do this, simply rotate the Setting Knob to select the channels to be Stereo-Linked. Then, press the function ON/OFF key to enable or disable the Stereo-Link setting.